I gave a lecture in Moscow during the spring about western-Soviet relations over the last century. With the partial exception of World War II, it is a narrative of unrelenting hostility. After I had finished, a student asked, «why do they hate us so?» The answer is not complicated. You cannot cross «da man» in the United States, that is, the powerful, wealthy US «deep state», which sets the rules for everyone else and enforces its worldwide hegemony against disobedient states and leaders. You could not get more disobedient than the Bolsheviks. In November 1917, or October according to Julian calendar, they seized power in Russia and declared their intention to make a world socialist revolution. You can imagine the indignation and anger of the western powers, all at war with Imperial Germany, looking over their shoulders to see that revolution had erupted in Russia. It’s a complicated story but not everyone in the west reacted blindly to the Bolshevik seizure of power; none other than the British Prime Minister David Lloyd George thought the Entente should back the Bolsheviks against the Germans. His idea was an early prototype of the eventual Grand Alliance. In 1918 there were few takers for that eccentric idea especially when the Bolsheviks annulled the tsarist state debt and nationalised banks and industries in which foreigners held billions in investments. In the west these actions struck at the heart of the capitalist world order, and for the next three years, the Entente sent money, arms and troops to overthrow the Soviet government. 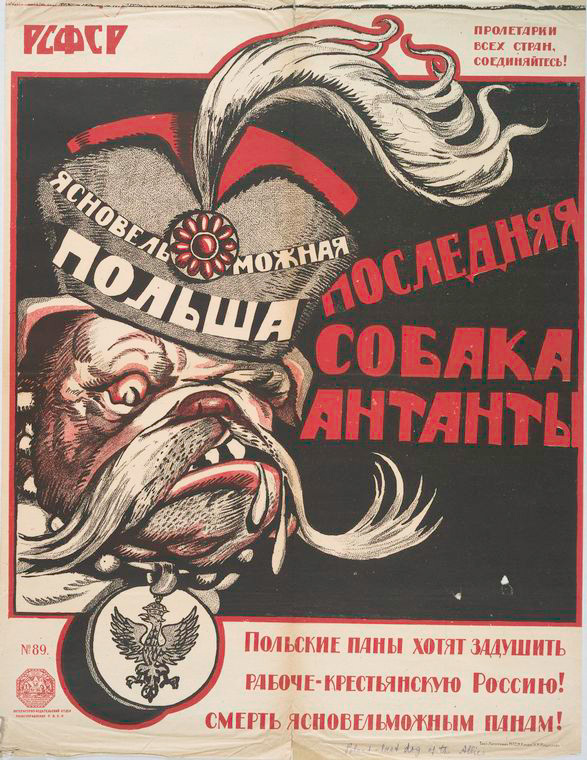 The Bolsheviks acted as defenders of the revolution but also as defenders of Russia. It was an easy transition since the so-called Allies, had they succeeded in reversing Soviet power, would have established a Russian semi-colony, much as they sought to do in the 1990s. 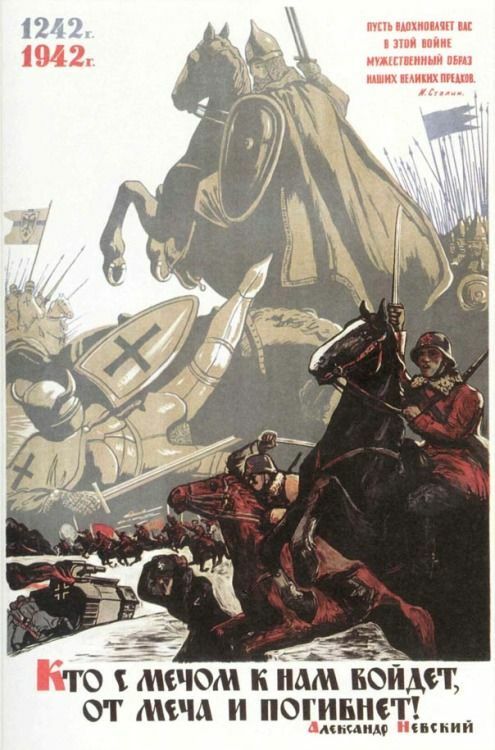 The Poles too were mobilised against Soviet Russia, launching an offensive in April 1920, with tacit French support, to re-establish their 18th century eastern frontiers, including the city of Kiev. The Polish plan did not work out as intended, the Bolsheviks fought back, portraying themselves as defenders of the traditional Russian state. Admittedly it was an incongruous role for world revolutionaries, but if you scratched the skin of most Bolsheviks, you would find defenders of Russian national security interests. 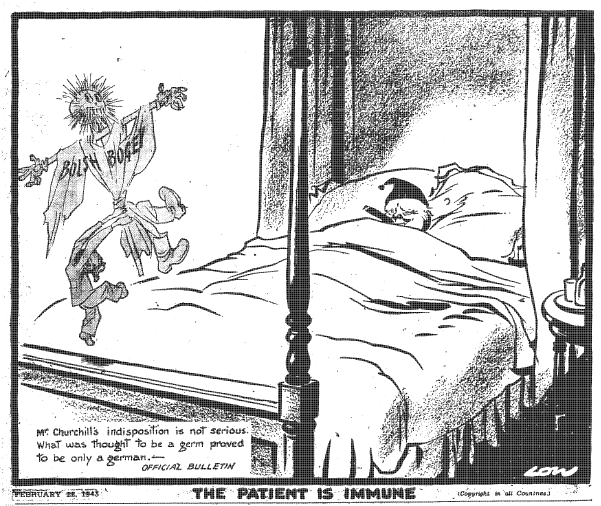 During the interwar years Soviet-western relations were almost always bad. The former Entente powers punished Soviet Russia for its refusal to pay the tsarist debts and compensate foreigners for nationalised property and equities. 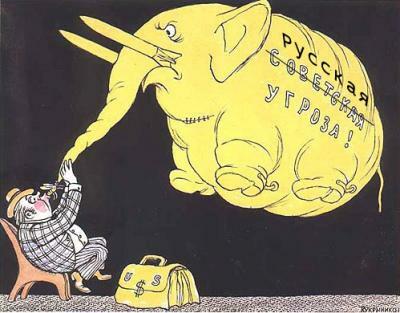 They applied economic sanctions to break the Soviet state where military force had not succeeded. 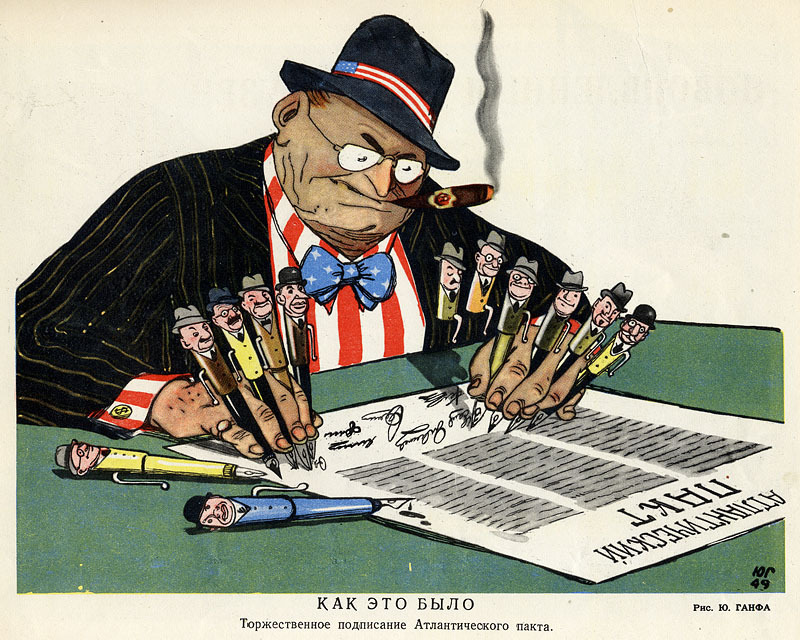 The red scare, anti-Soviet electoral politics, and containment characterised US, British and French conduct during the 1920s. Those policies did not work. The Soviet government relied on its own resources to modernise its economy. Joseph Stalin’s policies were brutal and ruthless, but they led to the building of a powerful, industrialised state by the end of the interwar period. During the 1930s the Soviet government, recognising early on the menace of Hitlerite Germany, proposed collective security to the western powers, in fact, a defensive anti-Nazi alliance. At first there was some western interest in Soviet ideas, but not for long. One by one, the USSR’s putative allies reverted to what one Soviet diplomat, Ivan M. Maisky, called Sovietophobia and Russophobia. Adolf Hitler portrayed Germany as a bulwark against communism, and the French and British elites played into his hands. As Maisky put it, the great question of the decade was «Who is enemy no. 1, Nazi Germany or the USSR?» With notable exceptions, ruling elites in Europe got the answer wrong. You have to give Stalin credit for he stuck to collective security for six years, in spite of all the failures. Only in August 1939 did he abandon this policy when it became obvious that France and Britain were not serious about a war-fighting alliance against Nazi Germany. It was then that the Nazi-Soviet non-aggression pact was concluded. Western opinion was generally indignant, conveniently forgetting the Munich accords in 1938 and all the other western attempts to compose with Hitler. Even today Russophobic politicians, journalists and historians harp on the non-aggression pact to blacken Russia and its president Vladimir V. Putin. Such manipulations remind me of the Biblical parable of the mote and the beam. The west, then as now, should pull the beam out of its own eye before criticising the mote in the eye of Russia, Soviet or otherwise. Unable to count on France and Britain, Stalin concluded a modus vivendi with Hitler, not to make an «alliance» with him, but rather as one scorpion wary of another might do, circling and raising its tail high, ready to strike. 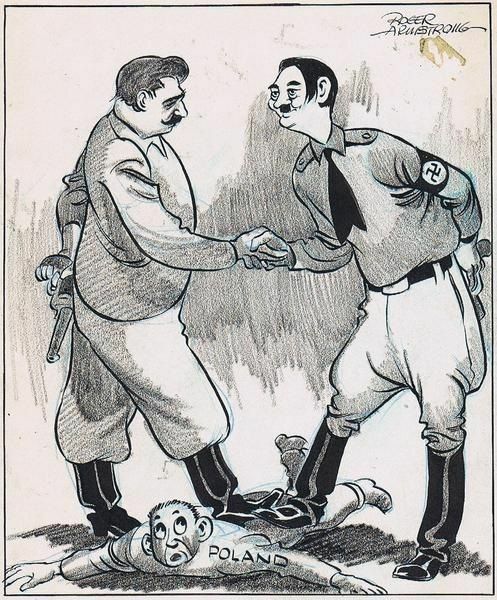 Stalin did not want to fight alone against the NaziGermany, but he outsmarted himself because, as it turned out, the USSR was obliged to fight almost alone against the Wehrmacht for three years from 1941 to 1944. This was the period of the Grand Alliance against the Axis powers. I watched recently a Russian film about the Great Patriotic War. After some bloody fighting, one Red Army soldier asks another «what kind of allies are they, who let us do all the fighting against the Wehrmacht?» Not a bad question to ask. Perhaps it was unfair to Franklin Roosevelt, but not to Winston Churchill. FDR was a rare president who was able to keep at bay the Sovietophobic US «deep state». Churchill blew hot and cold about his Soviet allies, but as soon as the tide of battle turned against Hitler, he erupted about Russian «barbarians» and communist «crocodiles» even though some of his cabinet colleagues were scandalised. In April 1945, it took the US «deep state» only a fortnight after the death of FDR to persuade his successor, Harry Truman, to call into question the Grand Alliance. 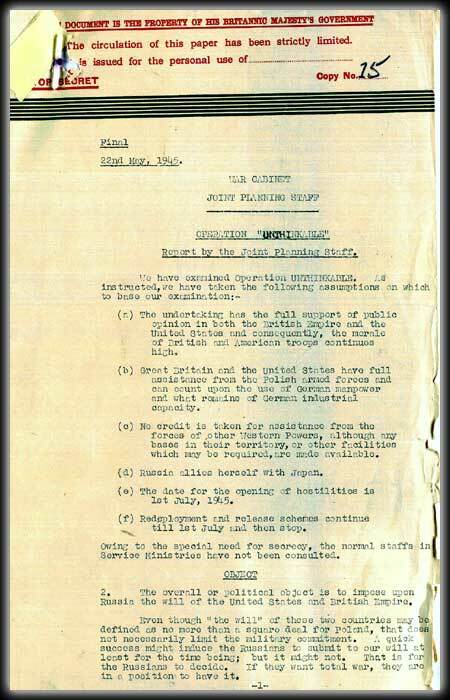 It was also a fortnight after VE Day in May 1945 that Churchill received a copy of «Operation Unthinkable», a plan he requested to make war against the USSR, stiffened with ten German divisions. The United States was quick to follow up with more realistic ideas on building up a West German «partial state» as the best way to contain or even roll back the Soviet presence in Europe. With the Marshall Plan in 1947, the United States was able to buy the loyalty of Western Europeans, transformed into dependent compradors. Stalin could not compete in that game of rich Uncle Sam, poor Uncle Joe. 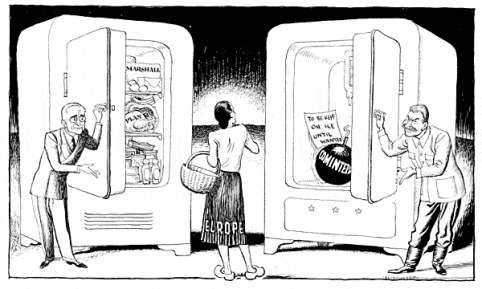 Having greased the rails with the Marshall plan and CIA money, NATO was established in 1949. Soviet propaganda portrayed the NATO «allies» as mere US ciphers. Little has changed since then. 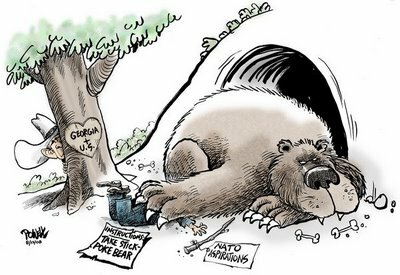 Present day NATO members remain compradors, obedient vassals of the United States, rather than defenders of the national interests of the countries they represent. It took another forty years for the USSR to collapse and disappear. That period was marked by visceral hostility, interrupted only by a brief period of cosmetic détente after the Cuban missile crisis in 1962. World War II had scarcely ended before the red scare and containment policies returned to the fore. It was Act II of the Cold War. In the 1980s the USSR tried to defeat an Islamic insurgency in Afghanistan supported by the United States. The Americans allied themselves with Islamist fundamentalists, most notably Osama bin Laden, portrayed as a hero then, who became a villain later. «Blowback», one American professor called it. Bin Laden was eventually shot by US Navy Seals in Pakistan. There were many other Wahhabis, however, to take his place. After the disappearance of the USSR, you might think the Americans would have declared victory and then offered a hand to the Russian rump state under Boris Yeltsin,. who played court jester in President Bill Clinton’s White House. Yeltsin claimed he had no choice but to submit to the Americans, but of course he had a choice. In 1991 he and two other Soviet politicians plotted the dissolutionof the USSR for their own political purposes. They sold out the country which the Bolsheviks had defended, and for which 26 million soldiers and civilians died during the Great Patriotic War. Yeltsin’s grovelling in Washington and his encouragement of his oligarchs’ looting of Russian national resources earned only American contempt. «Keep ‘em down» was the US policy; generosity was out. «We won, you lost,» the Americans proclaimed. Contrary to commitments made to the fatuous Mikhail S. Gorbachev about no NATO eastward expansion, NATO drove right up to Russia’s western frontiers. In 2000 when Putin was elected president, he publically promoted security and economic cooperation with Europe and the United States. After 9/11, he offered real assistance to Washington. The United States accepted the Russian help, but continued its anti-Russian policies. Putin extended his hand to the west, but on the basis of five kopeks for five kopeks. This was a Soviet policy of the interwar years. It did not work then and it does not work now. In 2007 Putin spoke frankly at the Munich conference on Security Policy about overbearing US behaviour. The «colour revolutions» in Georgia and the Ukraine, for example, and the Anglo-American war of aggression against Iraq raised Russian concerns. US government officials did not appreciate Putin’s truth-telling which went against their standard narrative about «exceptionalist» America and altruistic foreign policies to promote «democracy». Then in 2008 came the Georgian attack on South Ossetia and the successful Russian riposte which crushed the Georgian army. It’s been all down-hill since then. Libya, Syria, Ukraine, Yemen are all victims of US aggression or that of its vassals. The United States engineered and bankrolled a fascist coup d’état in Kiev and has attempted to do the same in Syria reverting to their «Afghan policy» of bankrolling, supplying and supporting a Wahhabi proxy war of aggression against Syria. Backing fascists on the one hand and Islamist terrorists on the other, the United States has plumbed the depths of malevolence. President Putin and Russian foreign minister Sergei Lavrov have made important concessions, to persuade the US government to avert catastrophe in the Middle East and Europe. To no avail, five kopeks for five kopeks is not an offer the United States understands. Assymetrical advantages is what Washington expects. One cannot reproach the Russian government for trying to negotiate with the United States, but this policy has not worked in the Ukraine or Syria. Russian support of the legitimate government in Damascus has exposed the US-led war of aggression and exposed its strategy of supporting Al-Qaeda, Daesh, and their various Wahhabi iterations against the Syrian government. US Russophobia is redoubled by Putin’s exposure of American support for Islamist fundamentalists and by Russia’s successful, up to now, thwarting of US aggression. Who does Putin think he is? From my observations, I would reply that President Putin is a plain-spoken Russian statesman, with the support of the Russian people behind him. For five kopeks against five kopeks, he will work with the United States and its vassals, no matter how malevolent they have been, if they adopt less destructive policies. Unfortunately, recent events suggest that the United States has no intention of doing so. After one hundred years of almost uninterrupted western hostility, no one should be under any illusions. Because President Putin wants to build a strong, prosperous, independent Russian state in a multi-polar world. Because the Russian people cannot be bullied and will defend their country tenaciously.